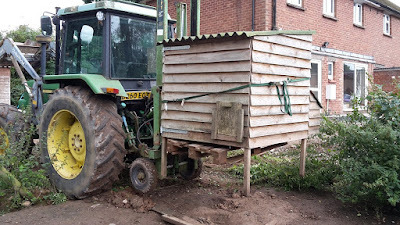 This weekend my dad and I have been carrying on with the extension and one job that needed doing was to move the chickens by the house. In doing this it gives us much better access to the garden to and to move building materials around. This got me thinking about the pros and cons of having the chickens next to the house. I've had chickens living there in one form or another for the past 4 and a half years. It was located about 15ft from the house and was big size, easily accommodating 20 or so chickens. Less likely predator attack - as the predator is much less likely to go so near to the house. Easy to collect the eggs - I have been known to run out and grab an egg half way through baking a cake. Quicker to feed and check water - well it's less far to walk anyway! Easier to enjoy their company! Noise - chickens even without a cockerel are noisy creatures. I personally like the noise they make but some people don't. Smell - there is a little bit of smell that goes with a large flock of birds, but cleaned out regularly it's not too much of an issue. Flies - this year this has been a major issue, we've had loads of lies in the house and we're sure it's from the chicken pen. Not on fresh ground - in a fixed pen like we had by the house you can't move your hens around to give them fresh grass, although they had loads of weeds as a constant supply of greens. What do you think - anything you'd add to the list? Do you keep your chickens near to the house? 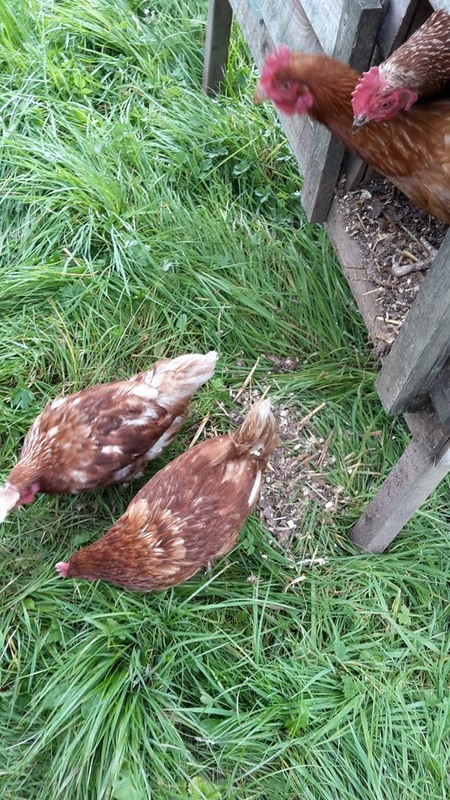 Our chickens are close to house but in the field side not the garden, they will be re-located as new accommodation is in the planning for them, there new house will have two pop holes and give access to two runs then fresh ground will be available on rotation. I'd love to have a big run of fixed pens that I could move the chickens about in and then grow stuff in the fallow pens. One day maybe! We suffer from flies because of all the cats next door, I use a product called Pine Sol, it's American and works longer at keeping flies away and it smells lovely. It does not work for ever nothing does, but it's the best I have found. I'll have to look into that as we have the horrible fly strips hanging everywhere with all the dead flies on. Lovely aren't they! You just answered the mystery of why I have RATS for the first time ever in my garden. Our new neighbors have chickens. I never made the connection--thank you! Personally I prefer them nearer the house, as you say you can keep an eye on them much easier. When ours are in the original Chicken World they have access to the woodland and therefore much better foraging and shelter from bad weather as well as being nearer the house. When they are on the hillside chicken world they only have grass and the young fruit trees, although obviously in a few years it will be a much more sheltered area with bigger trees. As we only have Bantam cockerels the noise is pretty negligible, and I love to hear the chunnering of happy hens. John - I can't belive I left that off - that should have been my main point. Mice and rats are always a problem when you have chickens. Sue - rats are always attracted to chickens unfortunately. I tend to bait the rats constantly with poison to keep on top of them. Sue - the noise never bothers me and the place seems weird if I can't hear the chickens. Illegal to feed chickens, kitchen scraps??!! Craziness my homesteading friend. We feed tons of scraps and that is what brings flies, but we free range all our chickens. Makes egg collecting more challenging but they are so yummy. We keep a large guard dog as well so we don't lose chickens to predators except when the mama walks through the pig pen with a newly hatched brood. The pigs think they are snack crackers. I've done a blog post on the law for tomorrow. never even though of pigs eating teh young chicks. I had trouble this year with a hen hatching out chicks witht eh other chickens around and find it best to separate them off. I put my coop way out back when it was set up and have regretted it ever since. It's horrrid in the winter to trudge through boot-high snow several times a day to break ice in the water dishes and too far out to run electric. I wish very much that it were closer to the house. I also like the sounds of chickens. About the no kitchen scraps law, I have wondered is this just meats and such? Or are you prevented from giving the chickens things like vegetable peelings too? It'll be through the mud here not the snow but winters are always a pain when it comes to feeding chickens, I like to think I'll keep moving them onto fresh grass but it soon goes muddy. Oh and about the law I've done a short post on it for tomorrows blog, we have some great laws in the UK! Why is it illegal to feed kitchen scraps to the chickens? I do miss having chickens but we had so much trouble with raccoons it was heartbreaking to lose them. My husband would have a stroke if I asked him to bring the pen closer to the house. I would have them in the garage if I could. But we do have several sources for free range eggs and we do not have to trudge through the snow. Also we have cows and horses across the road so we always have dratted flies (and ugly fly strips). My coop is 15 feet from my house. I wanted it close 1) to chase of predators 2) we get snow, I don't want to go across the whole lot to get them food and water. There are two trees in their area, so they have shade/protection from the weather. I put up fly tape in the fall to catch the flies.